At midnight, July 1, NBA teams were officially allowed to speak to free agents. Several deals have already been signed. See who is heading where below. 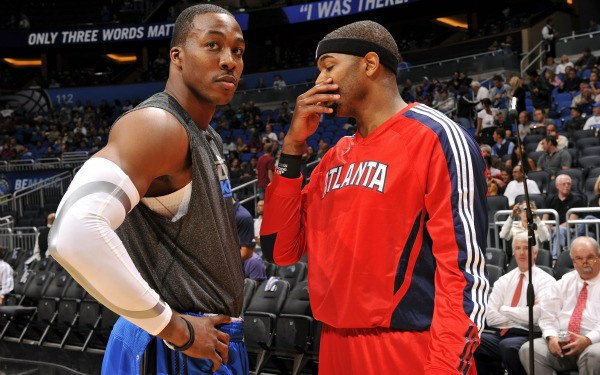 Dwight Howard and Josh Smith will be sporting new uniforms next season. 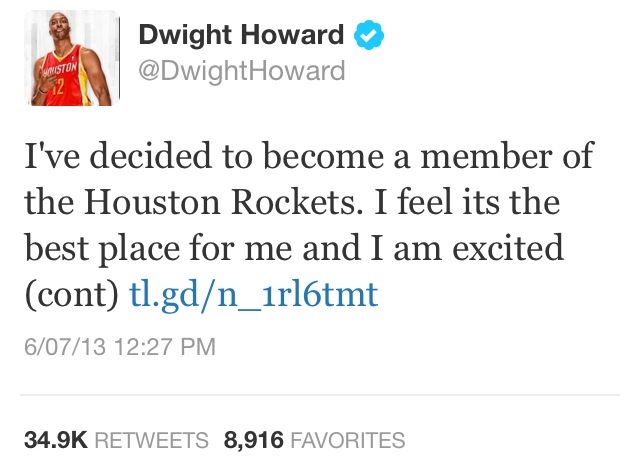 The Dwight Howard free agency saga has finally come to a conclusion. The seven time All-Star choosing not to return to the Los Angeles Lakers and instead sign with the Houston Rockets. Howard will reportedly sign an offer from Houston, estimated to be worth $88 million over four years, despite the Lakers being able to offer a $107 million, five year extension. Lakers’ GM released a statement revealing Howard’s decision to leave LA. 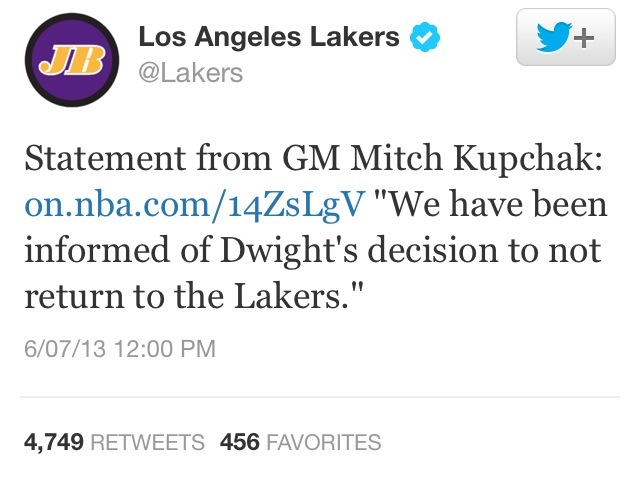 Lakers general manager Mitch Kupchak confirmed that Howard had informed the Lakers of his decision not to stay via the Lakers’ Twitter, and a tweet from Howard himself soon after confirmed the news. Howard then took to his own Twitter to confirm the news. The move pairs Howard with Houston superstar James Harden, and the exciting young core of Jeremy Lin, Omir Asik and Chandler Parson. However, with the Rockets looking to make further moves it is unclear how the team will take shape and who will be suiting up for them at the seasons’ open. One thing for certain is the Rockets look to be a contender in the Western Conference for years to come. Another team looking to make noise in the West is the Golden State Warriors after they secured the signature of swingman Andre Iguodala to the tune of $48 million over four years. The Warriors looked to be restricted in their free agency options due to little cap room but they managed to dump a large amount of salary in a trade with the Utah Jazz. The Jazz traded the non-guaranteed contract of Kevin Murphy, worth $788,000, in exchange for the expiring deals of Richard Jefferson, Andris Biedrins and Brandon Rush, worth approximately $24 million, plus a coveted 2014 first-round draft pick, a 2017 first-rounder, and two future second-rounders. The trade allows Golden State to add a defensive stopper and athletic wingman to their already explosive scoring squad, while the contracts Utah received will come off the books in 2014, giving them cap space in a lucrative free agent market, and they gain a valuable bargaining chip in a second 2014 first-round pick. Moving to the Eastern Conference, the Detroit Pistons have signed arguably the second biggest free agent available after Josh Smith penned a four-year, $56 million deal with the team. The move comes as a shock to some, many assumed that Smith was a priority signing for Houston to pair with Harden and Howard, but the Pistons were always going to be players in free agency with roughly $24 million worth of cap space. It is unclear whether Smith will spend his minutes playing small or power forward in Motown, but a frontcourt consisting of Smith, who is still only 27, Greg Monroe, 23, and Andre Drummond, 20 in August, is a fearsome young nucleus. The move leaves the Pistons with roughly $8.5 million in cap space, and with rumoured interest in Celtics’ guard, Rajon Rondo, and $17 million worth of expiring deals (Charlie Villanueva and Rodney Stuckey, $8.5 each) there could be more moves on the horizon in Michigan. The New Orleans Pelicans have continued to reshape their roster after acquiring former Rookie of the Year Tyreke Evans in a three-team deal. Evans gave the Pelicans a verbal agreement that he would sign their four-year, $44 million offer sheet, but Sacramento were determined not to lose him for nothing. The Kings will deal Evans to New Orleans in return for Greivis Vasquez, while centre Robin Lopez and guard Terrel Harris were sent to Portland, in return for two future second-round draft picks, in order to make cap room. New Orleans also received Portland’s 2013 second-round pick Jeff Withey in the deal. The deal makes clear the Pelicans desire to make the playoffs this year, adding another exciting young player to team up with former number one pick Anthony Davis, scorer Eric Gordan, sharpshooter Ryan Anderson and All Star guard Jrue Holiday, who was acquired on draft night in exchange for Nerlens Noel. Meanwhile, Sacramento will be glad to get something in return for Evans, and Portland get a true centre in case JJ Hickson decides to leave. The New York Knicks have managed to retain the services of reigning Sixth Man of the Year JR Smith on a four-year, $25 million deal. It was an important signing for New York, who have minimal cap space, in order to keep the core of the team which finished second in the East together. The Knicks also re-signed point guard Pablo Prigioni, three-years, $6 million. However they could not afford both Prigioni and Chris Copeland, who reached an agreement worth at $6.1 million, two years with the Indiana Pacers. Big man Al Jefferson is on his way to the Charlotte Bobcats for $40.5 million over three years. It was a surprising move for both parties, an established centre shunning several other suitors to sign with a team that has only won 28 games in the past two seasons, and a rebuilding franchise throwing so much money at a good but not great player. Regardless, Jefferson will be a good mentor for 2013 first round pick Cody Zeller, and add toughness and rebounding to a team lacking in every area. In other signings, OJ Mayo is on his way out of Dallas after signing a three-year, $24 million deal with Milwaukee. Dallas immediately replaced Mayo with Jose Calderson on a four-year $29 million deal. The San Antonio Spurs extended the contract of Manu Ginobili for two-years, worth $14 million, and inked sharpshooter Marco Belinelli for $6 million over two. New Orleans re-signed forward Al-Farouq Aminu for one-year, $3.7 million, and the Atlanta Hawks gave a two-year, $5 million contract to DeMarre Carroll.